This article is about a French liqueur. For the cartoonist-author of the strip Pearls Before Swine, see Stephan Pastis. Pastis (French pronunciation: ​[pa.stis] ; UK: /ˈpæstɪs/ or US: /pæsˈtiːs/) is an anise-flavoured spirit and apéritif from France, typically containing less than 100 g/l sugar and 40–45% ABV (alcohol by volume). Pastis was first commercialized by Paul Ricard in 1932 and enjoys substantial popularity in France, especially in the southeastern regions of the country, mostly Marseille, (Bouches-du-Rhône) and the Var department. 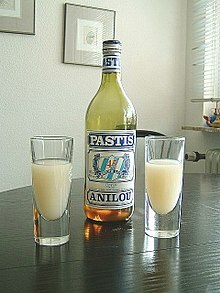 Pastis emerged some 17 years after the ban on absinthe, during a time when the French nation was still apprehensive of high-proof anise drinks in the wake of the absinthe debacle. The popularity of pastis may be attributable to a penchant for anise drinks that was cultivated by absinthe decades earlier, but is also part of an old tradition of Mediterranean anise liquors that includes sambuca, ouzo, arak, rakı, and mastika. The name "pastis" comes from Occitan pastís which means "mash-up". By legal definition, pastis is described as an anise-flavored spirit that contains additional flavor of licorice root, contains less than 100 grams/l sugar, and is bottled at a minimum of 40% ABV (pastis) or 45% ABV (pastis de Marseille). While pastis was originally artisanally produced from whole herbs like most spirits at the time of its creation, modern versions are typically prepared by mixing base alcohol with commercially prepared flavorings (essences and/or extracts) and caramel coloring. Pastis is often associated with its historical predecessor, absinthe, yet the two are in fact very different. Pastis does not contain grand wormwood (Artemisia absinthium), the herb from which absinthe derives its name. Also, pastis obtains its anise flavor from a distillation (or industrially prepared distillates) of star anise, a herb of Asian origin, whereas absinthe traditionally obtains its base flavor from green anise, a Mediterranean herb. Furthermore, pastis traditionally exhibits the distinct flavor of licorice root (another herb of Asian origin), which is not a part of a traditional absinthe. Where bottled strength is concerned, traditional absinthes were bottled at 45–74% ABV, while pastis is typically bottled at 40–50% ABV. Finally, unlike a traditional absinthe, pastis is a "liqueur", which means it is always bottled with sugar. Pastis is normally diluted with water before drinking, generally five volumes of water for one volume of pastis, but often neat pastis is served together with a jug of water for the drinker to blend together according to preference. The resulting decrease in alcohol percentage causes some of the constituents to become insoluble, which changes the liqueur's appearance from dark transparent yellow to milky soft yellow, a phenomenon also present with absinthe and known as the ouzo effect. The drink is consumed cold and considered a refreshment for hot days. Ice cubes can be added (after the water, in order to avoid crystallization of the anethole in the pastis). However, many pastis drinkers decline to add ice, preferring to drink the beverage with cool spring water. Although consumed throughout France, pastis is generally associated with southeastern regions of the country, particularly the city of Marseille, where it is nicknamed Pastaga, and with such clichés of the Provençal lifestyle as pétanque. 130 million litres are sold each year (more than two litres per inhabitant in France). 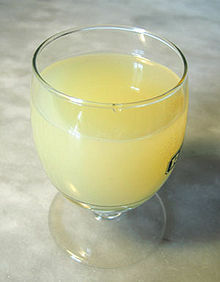 Pastis beverages become cloudy when diluted because they are anise-based. Such beverages contain oils called terpenes, which are soluble in an aqueous solution that contains 30% ethanol or more by volume. When the solution is diluted to below 30% ethanol, the terpenes become insoluble; this causes a cloudy precipitate to form in the solution. The same chemistry causes absinthe to go cloudy when diluted. ^ Pastis... The history. La Maison du Pastis (The Pastis House, Marseille). Accessed 25 March 2010. ^ Regulation (EC) No 110/2008 of the European Parliament and of the Council of 15 January 2008 on the definition, description, presentation, labelling and the protection of geographical indications of spirit drinks and repealing Council Regulation (EEC) No 1576/89. Official Journal L 039 , 13/02/2008 P. 0016 - 0054. Accessed 8 December 2011. ^ David de la Chesnaye; Danièle Boone; Delphine Poracchia; Stéphanie Poncelet; Damien Bismuth; Elizabeth James. "The way of life in Provence". France-la-visite.com. Retrieved 26 April 2011. ^ "OMB No. 1513-0020". Ttbonline.gov. Retrieved 26 April 2011. ^ Vitale, Stephen A.; Joseph L. Katz (May 2003). "Liquid Droplet Dispersions Formed by Homogeneous Liquid-Liquid Nucleation: The Ouzo Effect". Langmuir. American Chemical Society. 19 (10): 4105–4110. doi:10.1021/la026842o.